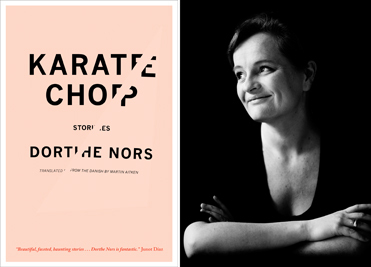 Dorthe Nors’s Karate Chop is one of the few books that truly deserves to be described with that overused adjective, “unique.” The Danish novelist’s first collection of stories is a short, sharp shock that hits you like, well, a karate chop to the neck. In fifteen stories that run from three to eight pages, Nors examines key moments in the lives of her quirky, very human characters as they struggle to make sense of other people in their surreal world. She gets right to the central conflict, stripping everything else away. It’s probably cliché to say, but there is a palpable Scandinavian coolness and efficiency to her stories. Her prose is crisp and economical, with nary a word out of place. She has polished these diamonds to an icy sparkle. The best stories are glimpses into strange lives or at least strange moments that lead to unexpected results. “Mutual Destruction” examines the relationship of two friends, Henrik and Morton, who hunt together and have agreed to shoot each other’s dogs when the time comes to put them down. But Morton’s wife Tina has left him, and there is clearly something amiss as Henrik watches Morton and his dog from just inside a stand of trees on a hill above Morton’s property. “They’d always been friends, but there was a lack of balance in it,” Henrik thinks…. “Now it was the last of them, the last dachshund, going about the yard at Morton’s heels down there. A man and his dog in the twilight, but something more. He had to take it in. Take a good look, because that’s how it was: there was something in Morton that shunned the light. Something Tina said was a kind of complex. He didn’t know what it was.” Nors leaves much unsaid, relying on the reader to infer the other relationship that goes all but unmentioned in Henrik’s narrative. “The Buddhist” follows a corporate type as he climbs the ladder to the top, where things don’t go quite as he planned. The narrative voice is so cynical and knowing, so droll, that what might be a dull and predictable series of incidents in the hands of a less talented author is instead taut and suspenseful. In “Female Killers,” a husband feeds his addiction to weird websites. “When she goes to bed, which is earlier and earlier now, he stays up at the computer.” That opening line is pregnant with possible meanings. He visits a variety of websites. “People who can predict things. Clocks that stop when someone dies. Calves with two heads, and women who kill people.” He becomes obsessed with one serial killer, Aileen Wuorno, who was eventually executed. “The odd thing about Aileen,” he notes, “is that she was the kind of person you could have had fun with in a bar when you were young, if the chance came around.” The story concludes simply but with import. Nors makes her readers think. The narrator goes on to ponder the discovery of a dead woman’s body in a suitcase by a man walking his dog by a pond in the park, mothers pushing strollers, and childhood games he played there with his friends. But Karl Erik had not lied to her, and as the story progresses, we find Annelise looking at her naked body in the mirror, locating bruises and marks. “Sitting there on the edge of the bed, she considered that she had most likely seen her worst and her best now.” Pressures and misunderstandings in their relationship had reached a head, and she had applied a metaphorical karate chop to the problem. The ramifications of her course of action remain unmentioned, and the last paragraphs reverberate in the reader’s mind. These concise, elegant, and disturbing stories require (and reward) rereading. This slim volume packs quite a punch – and you’ll feel it for quite a while. This sounds fantastic, I love the premise of Female Killers. Definitely one to look out for!